Parents are risking their babies' health because of a surge in the popularity of swaddling, according to an orthopaedic surgeon. The technique involves binding the arms and legs with blankets and is used to help calm a baby and prevent crying. But Prof Nicholas Clarke, of Southampton University Hospital, said swaddling was damaging developing hips. The Royal College of Midwives and other experts advised parents to avoid tightly swaddling a child. Swaddling has been widely used in many cultures globally. It is thought the blanket wrapping can simulate the feelings of being in the womb and calm the child. But the technique holds the legs out straight and restricts movement, which can alter the development of the hip joint. Writing in the journal Archives of Disease in Childhood, Prof Clarke argued: "There has been a recent resurgence of swaddling because of its perceived palliative effect on excessive crying, colic and promoting sleep. "In order to allow for healthy hip development, legs should be able to bend up and out at the hips. This position allows for natural development of the hip joints. "The babies' legs should not be tightly wrapped in extension and pressed together." Jane Munro, of the Royal College of Midwives, said it was a "seemingly innocuous" thing to do, but it posed "significant problems" for the baby. She said there was also the risk of the baby overheating and a raised risk of cot death. She added: "We advise parents to avoid swaddling, but it is also crucial that we take into account each mother's cultural background, and to provide individualised advice to ensure she knows how to keep her baby safe, able to move and not get overheated." Andreas Roposch, a consultant orthopaedic surgeon at Great Ormond Street Hospital, said: "Similar effects may be seen in all devices or manoeuvres that place the legs in a purely straight position for prolonged periods in this critical age of early infancy. "Swaddling should not be employed in my view, as there is no health benefit but a risk for adverse consequences of the growing and often immature hips." 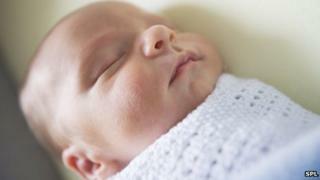 Rosemary Dodds, of parenting charity the NCT, advised against tight swaddling. "It is helpful to raise awareness of hip dysplasia in relation to swaddling. Some parents and babies seem to like swaddling, but it is important that babies do not overheat and their legs are not restricted. "Videos are available on the NCT website showing parents who want to swaddle their baby how to do so safely."